Charlton have completed the signing of Marcus Bent from Everton for an initial £2m fee, which may rise to £2.5m. The 27-year-old striker put pen-to-paper on a three-and-a-half year deal at The Valley. Bent said: "Charlton are a team I've always looked at with high regard. I can't wait to get started and am really looking forward to it. "They always produce strong teams down here and it's nice to get a chance to play for Alan Curbishley." Curbishley is a long-term admirer of Bent and moved for him after agreeing to sell Jason Euell to Birmingham. 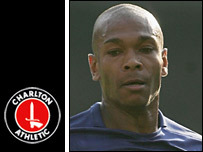 "There were rumours in the summer and I think it's been ongoing," Bent told the Charlton website. "Coming up to the transfer window I know Everton have been looking to bring another striker in. That didn't mean I had to go but I felt it was better for me as I wasn't playing. "I was happy at the club but not playing means that I'm not happy in football terms." Bent made 42 appearances for the Toffees last season and his seven goals helped the Goodison Park club to Champions League qualification. But he has not been a regular in David Moyes' side this season, despite the club struggling in the Premiership. Bent is now hoping to kickstart the Addicks' frontline in a season that started with such promise. "I want to move on and I want to better myself and do as good as I can. That is playing at the highest level and being at the top end of the table. And I think at Charlton we can achieve that."